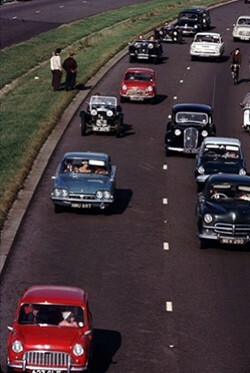 The big event in motoring in the sixties was motorways. The first stretch of motorway in Britain was not the M1, but the Preston By-pass, now part of the M6, which was opened in 1958. It was in fact closed only a few weeks later when frost broke up the surface! The first stretch of the M1 was built between March 1958 and November 1959 at a cost of 18,000,000. Fittingly as the fifties ended and the sixties began, a new age in motoring dawned. The impact of motorways on driving is difficult to appreciate in today's congested times - but it halved journey times. It ushered in a new era of fast and powerful cars. The Jaguar MkII was actually launched in 1959, in time for the M1. A new type of fast touring car - the GT - was being built to cope with the new conditions. It is no coincidence that MG illustrated the brochure for the new MGB GT with a picture of the car on a motorway - a beautifully clear motorway at that! Launched in 1965, the MGB GT was a closed-in version of the MGB, which was first seen in 1962. BMC had taken three years to produce the GT, leaving motorists less than two years to appreciate its top speed of in excess of 105mph before speed limits were introduced on motorways. My own memories of motorways are, as a child, on my way to the seaside. They were fast, generally empty roads. Spotting the derelict houses that were dotted along the route provided a break from the boredom. Motorways were built in the era prior to "public enquiries" and concern for the environment did not exist. My parents were simply happy to wave goodbye to the traffic jams of the past. The car that most people associate with the sixties, the Mini, was actually a product of the late fifties. BMC Chairman, Leonard Lord was disgusted by the appearance of bubble cars on British roads as a result of petrol rationing following the Suez Crisis in 1957. He asked top designer, Alec Issigonis, to design a car that was smaller than the Morris Minor, but nevertheless could seat four people in comfort. Unlike the bubble cars, it was to be in every way a "proper"car. Issigonis' design was revolutionary. Instead of mounting the engine North-South (front-back) and driving the rear wheels, the Mini's engine was to be mounted across the car - East-West, and the Mini was to be front-wheel drive. This arrangement meant that the new car would be at least as spacious as conventional small cars of a larger size - such as the Austin A35 or Ford Anglia. 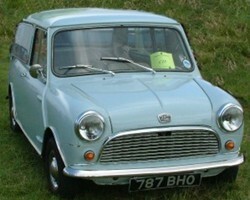 The Mini was launched in August 1959. It was initially available as an Austin Seven (or Se7en in Austin's advertising copy of the time) or a Morris Mini Minor. Neither of these names caught on and the car became known to the public as just the "Mini". The first Minis were basic by today's standards. They had sliding windows. Wind-up windows did not come until 1969. Rubber mats covered the floor of the basic model, although carpets were available on the deluxe variant. There was no dashboard as such, just a centrally mounted speedometer separated two parcel shelves either side. There was no heater on the basic version. A heater was standard on the deluxe version. However, at the time it was not uncommon for much larger and expensive cars to come without a heater or full carpeting. The Mini took a year or two to really catch on with the public, but when it did, it sold extremely well throughout the decade. It was soon joined by the more sporting Mini Cooper and Cooper S - which won the Monte Carlo rally three times. There was also a Mini van and an estate car available with or without Morris Traveller style wooden framing, and two upmarket versions, the Riley Elf and Wolseley Hornet. These had wooden trim and leather seats. They also lost the Mini's distinctive external door hinges and were the first of the Mini range to have wind-up windows and the 998cc engine. The Mini had a much broader appeal than BMC anticipated. Its small size made it ideal for parking in London. It was taken up by the rich and famous, as well as the ordinary. Coach builders, Harold Radford, took a basic Mini, usually a Cooper, and retrimmed the cars to incredible standards of luxury. Deep pile carpets, well-padded leather seats, wooden facia and cappings and special paint jobs made the Radford Minis stand out from the crowd. Pop stars and celebrities bought them. The ultimate Mini of the era was a Downton-tuned, Radford Mini Cooper - luxury and speed combined. Although the Mini undoubtedly was the car of the sixties, the real competition for the mass market was between BMC's 1100 series and Ford's Cortina. The 1100 was Issigonis' next car after the Mini. He took the transverse front wheel drive concept one stage further and designed a car of just over 12' long with a cabin as spacious as those of contemporary cars of 14' or more. The styling of Issigonis' initial concept was sharpened up by Farina. The result was a very neat and crisp design. The Morris 1100 was launched in August of 1962. The Austin version appeared a full year later in September 1963. The 1100 was considerably better equipped than the Mini. Standard and deluxe versions were available priced at 675 and 695 respectively. Interior features included trimmed doors and better quality seats. Deluxe features included such luxuries as a passenger's sun visor, front door pockets and padded rear quarter panels. A heater was still an option in both versions. Appearing in September 1962, the Ford Cortina competed head to head on price with the Morris 1100. It was priced at 639 for the standard version and 666 for the deluxe. Although these prices were for two door Cortinas. The four door models appeared at the end of 1962 and after purchase tax revisions in the budget of that year, they were priced at 591 standard and 615 deluxe. Morris 1100s, which were always four door, were then selling for 592 and 611 for standard and deluxe. In spite of the similarity in price, the cars were very different in character. Ford advertising called the Cortina "The small car with a big difference". The Cortina was a conventional, rear-wheel drive saloon car. It's really revolutionary feature, though, was the price. Never before had a family saloon of this size offered such value for money. Ford did not cut corners with the design. The Cortina was very stylish and up to the minute. The overall look was well balanced and neat. It's circular rear lamps finished the design off beautifully. The Cortina Mk1 was used by Hattie Jacques' "Glam Cabs" in the film "Carry On Cabby" as sleek modern transport, driven by glamorous lady cabbies - to compete against husband Sid James' fleet of, by then, out-dated Austin Taxis built to a pre-war design. The Cortina was 2ft longer than the 1100, but offered similar interior space. Ford had tried hard to keep the weight down and both cars weighed 16cwt. The Morris's 1098cc engine produced 48bhp at 5100rpm whilst the Cortina's 1198cc engine managed 48.5bhp at 4800 rpm. The Cortina's top speed was 77mph and it took 22.5 seconds to reach 60mph from rest. The Morris 1100 was a fraction quicker managing 78mph and a little more economical 32.7 mpg as against 30.2 mpg - but I am splitting hairs here. It was really down to personal preference. Both cars had strong followings throughout the sixties. Initially the 1100 was ahead in sales, but lost out by the end of the decade to the Cortina. In October 1966 the Cortina became the Mk2. The new Cortina was, according to Ford's sales literature, "more Cortina". They were trading on an already established name and made it better. Stylistically, the Cortina had moved on. It had much straighter and squarer lines than the original Cortina, fitting in with the fashion of the time. It looked a far more modern car. In comparison with the outgoing model, the new Cortina was the same length, 14 ft, but 2.5 inches wider. Overall it was roomier, and better finished and equipped. However, it did lack some of the original car's undoubted style. Ford had positioned the new model slightly higher up the in the saloon car market. In 1967, the new Cortina sold for 749 in four door deluxe form. Its original rival, the Morris 1100 was now selling for 689 for the four door deluxe. 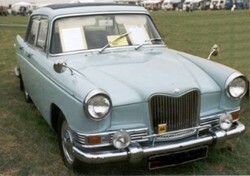 In Autumn 1967, a facelift was applied to the Austin/Morris 1100 range. The cars received cropped tail fins. Fins by this time were becoming unfashionable. However, when the Austin 1800 was revamped a year later, it was given fins for the first time! Both cars (Morris and Austin) had a new grill and were available as 1300s as well. Both were available as deluxe, or super deluxe, there were no basic models. The deluxe version featured a central speedometer with parcel shelves either side, whereas the super deluxe had a much better equipped dashboard with a strip speedometer. The interior of the deluxe was actually quite plain. The super deluxe car had two-tone door trims, which were, to my eyes, more attractive. Although mechanically similar, the new cars looked considerably more modern than the cars they replaced and continued to sell well. Although the Cortina and 1100 offered most of the requirements of a five seater family saloon of the sixties, most of the major manufacturers produced a slightly bigger and better equipped car along traditional lines throughout the decade. BMC offered the Farina styled Morris Oxford and Austin Cambridge saloons throughout the decade. These were extremely popular with more conservative buyers and no sixties street scene would be complete without one of these cars. Originally launched in 1959 as the Morris Oxford Series V and Austin A55 Mk 2 Cambridge - the A55 Mk1 was styled completely differently, although had similar engine and running gear. These cars were rather long and narrow looking with large tail fins. Originally they were fitted with a 1489cc engine and managed a top speed of 78mph. Inside, the Austin was quite plain. The Morris was slightly more glamorous. It looked like a restrained American fifties saloon (very restrained that is, but the impression is there, nonetheless). They were extremely roomy inside - much more so than the equivalent modern car. Both cars were given a facelift in 1961. The models became the Morris Oxford Series VI and the Austin A60 Cambridge. Improvements included a larger engine, 1622cc, a longer wheelbase and wider track. The overall result was a much better car. The wider track significantly improved road holding. Both cars could now reach 80mph and accelerated from 0 to 60mph in 21.4 seconds. Not spectacular, but respectable for the time. Externally both models had new grills and less prominent fins. The Austin Cambridge often featured a flash along the bodywork of contrasting colour to the paintwork. It was also given a wood effect dashboard, which was a significant improvement over the plain, painted metal affair of the earlier car. In this form both cars remained unchanged for the remainder of the decade. The Austin was withdrawn in 1969 and the Morris in 1971 - to be replaced by the Marina. Alongside these cars were more sporting and luxurious versions produced under other BMC badges. The Wolseley 15/60 and 16/60 were mechanically similar to the Austin A55 and A60. They were distinguished by the make's famous illuminated badge and traditional grill and a rather striking two-tone paint job, when specified. Inside, the Wolseley was luxuriously trimmed with a full wood veneered facia and door cappings, high quality leather seats and deep pile carpeting. Selling in 1967 for 868, as opposed to 804 for the deluxe version of the Cambridge, it was good value for money. For the more sporting driver BMC offered a choice between the MG Magnette Mk IV at 916 and the Riley 4/72 at 916. These cars had a twin carburettor version of the 1622cc engine and could reach a maximum speed of 86mph. Additionally, the cars were trimmed to a very high standard - hence the premium over the Wolseley in price. Both were face lifted versions of a previous incarnation based on the original Farina saloons - the MG Magnette Mk III and Riley 4/68. The MG in particular was not well received by MG fans. The car replaced the Magnette ZB which handled well and was well liked. The Farina versions were far less sporty in their handling characteristics and were not really a proper sports saloon. Having said this, they were popular with the general public and outsold the original Magnette. Both were stylish and upmarket family saloons. BMC made a clean break with the past in their medium sized saloon cars in 1964 when they introduced the Austin 1800. This was another Issigonis design - front wheel drive, transverse engine. Originally it had been intended as a replacement for the A60, but with the availability of the 1800cc B-series engine designed for the new MGB sports car, it just grew whilst on the drawing board. The result was a very spacious and comfortable saloon. It was fast too, with a top speed of 90mph. Unfortunately, the styling was not to everyone's taste. It lacked the crisp neatness of the 1100 series. Inside it was rather plain, although the deluxe version has leather seats. The 1800 did not sell as well as expected. The A60 range still appealed to conservative buyers. The 1800 possibly did not have quite the right image. With better styling and interior, it could have done much better. It offered more space than most 3 litre saloons of the era. Vauxhall offered the Victor saloon in various guises throughout the sixties. At the beginning of the decade, Vauxhall were still selling a restrained version of the Victor of the late 1950s. This car was a scaled-down version of General Motors products in the US. In its original form, the Victor sported large amounts of chrome and had more than a passing resemblance to a 1956 Chevrolet. The styling was not to everyone's tastes and on top of that, the car had a reputation for rust, which the Company found hard to live down. In 1961, this ageing and by now unfashionable model, was replaced by the restyled FB series. These cars were much more restrained in style and bore no resemblance to the outgoing model. Vauxhall were keen to lose their reputation for rust and these new Victors were undersealed from new and the sills were injected with wax. These cars were available as standard, super and deluxe. In Vauxhall's hierarchy deluxe was top of the range. In Ford's super was - the Cortina super was top of the range. The deluxe Victor offered a touch of luxury with a walnut facia and leather seats. In February of 1962, the Victor range was topped by a high performance version the VX 4/90. This car had a top speed of 88mph and could reach 60mph from rest in 16.9 seconds. Externally it was identified with a contrasting side flash. Inside the car was well trimmed with leather seats and walnut facia and cappings. The VX 4/90 was in direct competition with BMCs Riley 4/68 and MG Magnette. Vauxhall replaced the FB four years later, in 1965, with the FC Victor. These cars were of a squarer profile and very much the fashion of the mid-sixties. The square profile was relieved by gently curving doors and side windows, which gave considerably more interior space over the previous Victor. The VX 4/90 was also carried over into the new models. Once again, it was stylish and well equipped and carried over the characteristic side flash. Rootes Group (Hillman, Singer, Sunbeam and Humber) offered cars in this class as well. Most notable was the Hillman Super Minx. This car, which was a development of the more basic Hillman Minx, was launched in 1961. It had unusual outward sloping fins at the back and oval tail lights. Rootes, like BMC, were keen on badge engineering and produced two luxury versions of the Super-Minx - the Humber Sceptre and the Singer Vogue. The Singer Vogue was a better trimmed version of the Super-Minx. The Humber Sceptre was quite special. It was meant to be a proper luxury saloon in the Humber tradition, but of compact size. Inside it was well trimmed. Although wood and leather did not feature, it was of high quality and stylish design. Externally it had a different roof line, but the main difference was under the bonnet. The Sceptre had a high compression version of the 1592cc engine fitted to the two lesser cars with a light alloy head as used in the Sunbeam Rapier sports saloon. This meant the Sceptre was a genuine 90mph car. The Sceptre was quite expensive, selling for 1029 in 1965. Alongside the Super Minx, Rootes' mainstay in the 1950s. It was given a restyle for the new decade and continued to sell well. Most of the major manufacturers produced a "big" car to top their range throughout the sixties. BMC made the Austin Westminster and Wolseley 6/99 and 6/1l0. These cars were larger version of the Farina styled A60 derivatives. They were conservative cars, but had a presence and elegance not associated with smaller saloons. The Westminster began the decade as the A99. It had BMC's 6 cylinder C series engine of 2912cc. Using twin carburettors, this engine developed 103bhp. It could propel the car to a speed of just under 100mph and reached 60mph from rest in 14.4 seconds - quite fast actually. These cars were surprisingly quite plainly finished inside, with only a painted metal dashboard. Along with the small Farina styled cars, the A99 was face lifted in 1961. It became the A110 with a 120bhp engine and a top speed of 102mph. A wood effect dashboard was also added at this time. Later in the decade, a super-deluxe version had full walnut facia and cappings and picnic tables for the rear passengers. The Wolseley followed the same pattern, becoming the 6/110 in 1961 with the same facelift. Externally the car had Wolseley's famous illuminated radiator badge and traditional grille. Inside it was trimmed to sumptuous standards, featuring walnut facia and door cappings and deep pile carpeting. Ford's Zephyr range was of similar size and performance. They started the decade with the Teddy Boys' favourite - the Zephyr MkII. Introduced originally in 1956, they belonged to the previous rock and roll era - fins and chrome. In 1962, Ford revamped the range and they became the Zephyr MkIII. The Consul name, which had been used to denote the 4-cylinder version of the earlier cars, was now dropped. Strangely enough, the Cortina was now the Consul Cortina. The new Zephyr still had fins, but a lot less chrome. Where the Austin represented solid conservative values, the Ford was flash, up to the minute and stylish. It was also a bit cheaper - by about 100. Ford's original line up had been Zephyr 4 (4 cylinders), Zephyr 6, and the glamorous Zodiac model. In 1965, they went one stage further in luxury and introduced the executive. These cars had a wonderfully stylish interior featuring deeply padded leather seats finished with leather buttons, as seen in many lounge bars of the era! The Executive sold for 1335 on its introduction - considerably more expensive than BMC's Wolseley 6/110 and indeed the basic Zodiac at 1048. Vauxhall also competed in this area with the Velox and Cresta range. There were essentially three types of sports cars in the sixties. The cheap and cheerful and fun cars like the Triumph Spitfire and MG Midget, the mid-range cars such as the MGB and Triumph TR4, and the very expensive and exotic cars such as the E-Type Jaguar and Aston Martin DB series. For what it offered, the E-type was incredibly good value for money. However, in the interests of concentrating on ordinary cars, I will limit the discussion to the MGs and Triumphs. MG Midgets and Austin-Healey Sprites competed head to head with Triumph Spitfires throughout most of the decade. The first of the small sports cars was the Frogeye Sprite of 1958. It was designed to make as much use as possible of Austin A35 running gear. It was an extremely well performing and handling 2-seater sports and great value for money. It was very spartan in terms of equipment. It did not even have an opening boot. You had to push luggage through from the passenger compartment. Triumph launched the Spitfire at the London Motor Show in October 1962. The prototype had lain under a dustsheet for nine months before being spotted by Stanley Markland, the Leyland Works Director, on a tour of the experimental department. Standard-Triumph was taken over by Leyland at the end of 1960 and Markland was seconded to Standard-Triumph. The Spitfire was a sleeker and more modern looking car than the Sprite, although by the time of the Spitfire's launch, the Sprite was already a much face lifted MkII without the distinctive 'frog-eyes'. The very similar MG Midget was launched in 1961 and was made alongside the Sprite until 1971 at Abingdon. Throughout the sixties, both cars were steadily improved, both in terms of performance and equipment. Along the way they gained such luxuries as door handles, wind-up windows and hoods that folded back behind the passengers' seats. Slightly further up scale of 1960s sports cars, MG also competed directly with Triumph. It was MGAs and Triumph TR3As at the start of the decade, by the end MGBs competed with TR6s, although by then both MG and Triumph were part of the Leyland empire. Left, is a publicity picture for the MGB GT taken in 1967. Outside the glamorous setting of the Bullring in Birmingham! My! how things change! Sports cars of the 1960s often seem spartanly equipped by today's standards. Often enthusiasts seek to add extra luxury such as walnut dashboards and deep pile carpeting. It might seem odd that MG saloons of the era were furnished with wood and leather, but the sports cars were not. Sixties' sports cars generally majored on performance rather than luxury. MGs had painted black dashboards and rubber mats on the floor. Triumph, by contrast, did introduce wood trim in the mid-sixties. On the first MGBs a heater was not standard. On the other hand, the instrumentation was superb. There were gauges for RPM, temperature and oil pressure - far more then is provided on a modern car. One interesting fact is that GTs rather, as opposed to convertibles, were much better equipped. Usually leather seats and extra luxuries features were standard. This applied to the MGB GT and to the Sunbeam Alpine GT. Triumph did not officially make a GT in the sixties.